Happy Friday friends! Today I'm sharing a recent Gilt purchase - a gorgeous Rivka Friedman blue quartzite ring that I discovered, upon receiving, matched my Kendra Scott "Andi" earrings. Not that I'm into matchy-matchy jewelry, but I found it interesting, nonetheless. See ya Monday! Love the shoes and top! The coral top looks so pretty paired with your gorgeous new jewels! Have a great weekend, Mary Ann! That top is a great color and I love the ruffles and waist tie. Have a great weekend Mary Ann. There's my bunny!! LOVE THOSE SHOES! 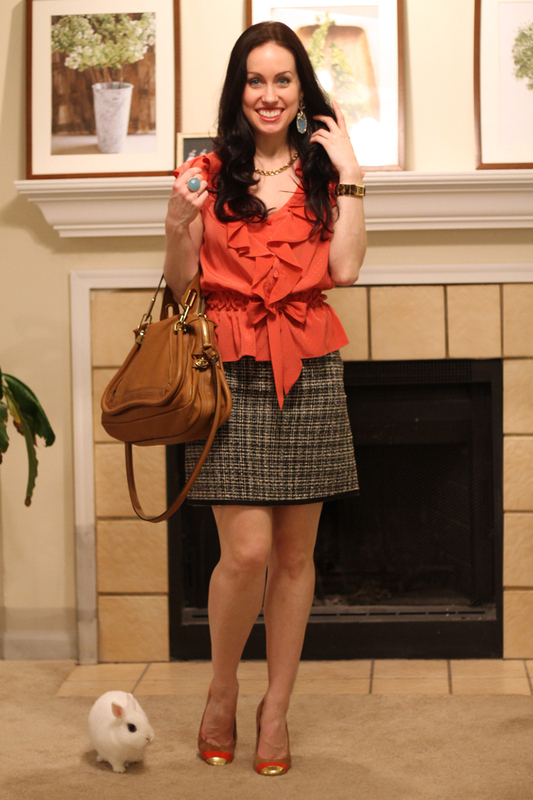 That coral blouse is so pretty and love the touch turquoise to the outfit! My friend has decided to make coral her "signature" color for spring. Love the outfit! Fantastic ouftit! Love the shoes, and the jewelry! They look so great with your blouse. I'm particularly in love with your ring! I like the pale blue color of your jewels! I like all the little matching touches in this outfit - the colour scheme of the shoes plus the blouse & purse, the gold hardware, toe caps, and accessories, etc. Lovely! I think this makes me sound matronly but I like matching jewelry! I am not really sure why...but I guess for accessories I like to match. I also love matching handbags and shoes...haha! What an outfit! So bright and sophisticated! I really like the coral and the tan bag. It all goes very well together. I LOVE this outfit Mary Ann! The top with the heels... and the blue ring and earrings are the perfect pop! !